What is the Three Rivers Community (TRC) ? 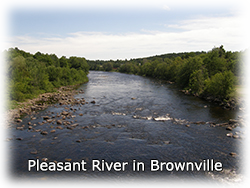 The Three Rivers Community is a group of towns in the Maine Highlands with a total population of about 6,000. 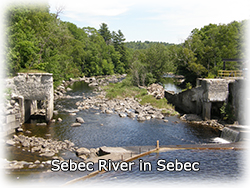 Our member towns include Atkinson, Bowerbank, Brownville, LaGrange, Lake View, Medford, Milo, and Sebec; and the unorganized townships of Barnard, Ebeemee, Katahdin Iron Works, Orneville, and Williamsburg. Beginning as a project at Penquis Valley High School, this website was created with the intent to link our communities, businesses, schools, and organizations together for better social and economic benefits. We provide the official online presence for all of our member communities and many local organizations. Milo is known as the "Town of Three Rivers," and that is where our name comes from. Pictured above are the three rivers that run through most of our towns. We are proud to feature 22+ live webcams of our local area on our website! The webcams were generously purchased by Fred Trask of Trask Insurance, and installed by Mike Russell of ProTech Solutions. We aren't done yet, as several other camera locations are still in the works. Click the link above for more information and a contact form to report Webcam Issues. Our community is located in the central region of Maine, 45 minutes north of Bangor. 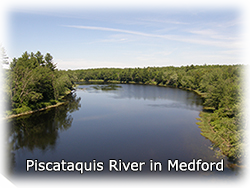 This area is also known as the Penquis Valley (which comes from the counties of Penobscot and Piscataquis), and Eastern Piscataquis County. Along with the greater surrounding region, we are now known as the Maine Highlands. Click the link above for a map of our communities. TRC offers several free services to local organizations and businesses. Click above to find out more! The Three Rivers Community of Maine is a not-for-profit organization run by volunteers from its communities. We are not supported by any group, but soley from volunteer work and your donations. We are always looking for more volunteers! If you'd be interested helping us out, let us know! Click above for more information.